With the growing stress on streaming services all around us, from the amazing iPlayer all the way down to Apple Music and Spotify, terrestrial television is losing its grasp on the market. License fees aside, there is still a lot of people around the country who watch television, whether it be for your news, your daily soap or just the occasional sports match. However, watching television is a bit difficult to fit in these days for the people who are out and about. 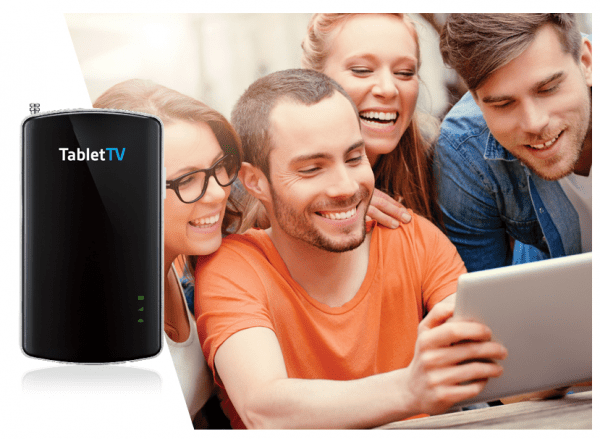 TabletTV, a device created by Motive Television is out to set that trend right, by offering you the ability to watch live television, on the go, on any tablet, without any wires. How? Simple. It packs in a battery and an antenna, with a portable TV tuner. As far as the device goes, it looks much like your usual WiFi Hotspot/4G or 3G dongle, apart from the obvious retractable antenna. LEDs on the front tell you if it is on, what the battery is doing and whether we have any connectivitiy. The bottom has a mini USB port to charge the device up, and a mini USB cable is included in the box. The back has a battery cover which allows you to take the battery out in case you’d want to. A reset button is also available, accessible via a pin. Apps are available for both Android tablets and iPad, but the apps are not compatible with Android Phones, even the big ones. It, of course makes sense, but just a word of warning. You need to download the TabletTV app from your respective store, and I used the Android app to test this device. When you start the app for the first time, it checks if you have a TV License. Since I do, I chose yes. After that, you have to connect to your TV Tuner. You do this by connecting to a WiFi network being transmitted by the device. Once connected, you can access the ‘TV’. After that, it scans for channels, and off you go. If it can’t find enough channels, or none, try and placing it by the window and as high up as possible. Since I live in Oxford, fairly close to a transmitter, I got a 102 channels via Freeview. After that, you can see what’s on, look further on EPG or browse your recorded shows. Oh yes, unlike other devices which often use Bluetooth, this uses WiFi, not that uncommon for media servers. The FAQs indicate that you should be able to set this up such that the device connects to your home/office WiFi, so you will still be able to access the internet. However, I was not able to find this option, so when I was using this to watch television, I had to give up on the internet. Now if I do have internet, I will normally be able to stream whatever I want to see. So, this device will probably be more used when I am out and about, and that is where having no internet shouldn’t really be a problem. Yes, it does, and of course, only live. It doesn’t have an option to record things in the future, or set up series links like some of the fancier boxes out there. Once again, it should be remembered, that this is designed for portability. You can access recorded television programs via the recorded tab on the app. Limits on how much you can record is defined by how much space is available on your tablet. So, how good is the reception? I am in a good reception area, so I can’t really complain. TV works fine and is only limited by the size and quality of your screen. It retails for £69.99 via Amazon, and there is a mains powered option available for £64.99. A handy device to keep in the back of your backpack at all times, specially when you are travelling!